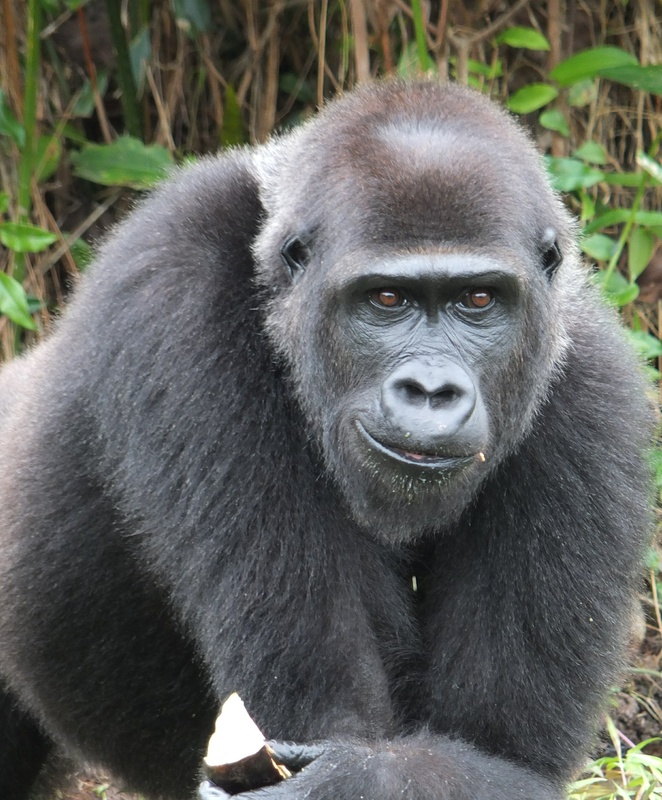 At the end of last year we brought you news of Mbwambe’s transfer in June 2017 to our Gorilla Protection Project at Batéké Plateau National Park in Gabon. She was accompanied by silverback Rapha and young female orphan Dikélé. Since then the three have been living on an island within the park, and have remained closely monitored by our team. Whilst they had been formed into a group before transfer, it came as no surprise that the move, and adjusting to life on the island, tested their relationship. The group was artificially created in captivity, another factor that could result in weaker attachments between individuals. Initially there were a number of disagreements between them, often triggered by food, and Rapha taking some time to relax into his role as leader of the group. But, over the first few months, the social bond between them strengthened and they are now far more cohesive. Rapha developed muscle and has matured into a handsome silverback, Dikélé, the youngest, has grown strong and healthy and Mbwambe, the only captive-bred of the three , has gained confidence and totally changed her feeding behaviour thanks to Dikélé. In fact their relationship reached the stage where the females were often seen on trees and nesting close to each other, and when they moved around the island, they always followed Rapha’s lead. They would also choose wild fruits and plants, such as aframomum rather than the cultivated fruits and vegetables. With all the signs good that this young trio were ready for the final stage of the release, they were given access to the bridge to the mainland in late October. It is early days, but so far we are delighted at how well they are doing. Our team continue to provide them with supplemental food, but they are already showing less interest, preferring to forage for wild plants, and confidently exploring the area around the release site. Soon we will raise the bridge which will allow the island to regenerate, ready for the next group of gorillas we are planning to reintroduce as part of our Back to the Wild campaign. More news on this next year on what will be a pioneering collaboration between two wildlife collections.